Diversified Metal Fabricators is a company dedicated to keeping the railroad industry moving. 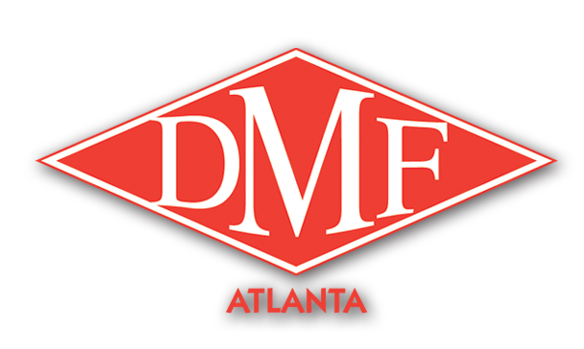 Based in Atlanta, Georgia, DMF is the leading manufacturer and supplier of hi-rail equipment used to build and maintain the lifeline of the railroad. DMF is a customer driven company which designs custom products to help their clients meet special needs. One of those products is DMF’s patented Rail-Roader rail guidewheels which make it easy for crews to get on and off the railroad track at a crossing. Railgear RW-1013 **GVWR 6,000 – 12,000 lbs. DMF RW-1013 railgear is designed for application to pickup and SUV chassis from 6,400 to 10,000 lbs. GVWR. Chassis up to 11,500 lbs. can be accommodated with our RW-1013HD. It is only applicable to vehicles with single rear wheels. RW-1013’s adjustable suspension, easy operation, and numerous safety and convenience features provide a smooth and sure ride. Railgear RW-1015 **GVWR 8,000 – 12,000 lbs. DMF RW-1015 railgear is designed for application to pickup and SUV chassis from 8,000 to 12,000 lbs. GVWR. The RW-1015 railgear typically stows within the length of the vehicle, eliminating the maneuvering and parking problems long associated with hi-rail vehicles. Without railgear protruding in front and behind, working around the vehicle is easier than ever. Access to the truck bed or rear hatch is not affected. Railgear RW-1019 / RW-1019B **GVWR 10,000 – 19,500 lbs. DMF’s RW-1019 railgear is a scaled-down version of our patented and very successful RW-1630 gear for large trucks. We now offer the RW-1019B that is adapted to truck chassis with rear-mounted fuel tanks. The RW-1019B also allows for more ground clearance for the front railgear. Railgear RW-1212 **GVWR 17,500 – 27,500 lbs. DMF’s RW-1212 railgear is designed for that rare-sized category falling between 17,500 and 27,500 lbs. The front guide wheel assembly attaches to the frame and front axle and lifts the front wheels off the track, thus, utilizing the vehicle’s front suspension. This design supports the vehicle as it was intended and helps the truck navigate curves smoothly and dampen out the effects of track irregularities. Railgear RW-1420 **GVWR 28,000 – 33,000 lbs. DMF’s RW-1420 railgear is known for it’s unique spokeless wheel design that helps to reduce weight. It shares the same patented side-shift feature and front suspension as the RW-1630, it’s larger counterpart, allowing it to get on and off the rail quickly. Railgear RW-1630/1650 **GVWR 33,000+ lbs. The DMF Roto-180 is a rotating dump body that permits its user to deposit the contents of the bed anywhere within a 180° arc. Between the dump body and the truck chassis lies its hydraulically actuated sub-frame which is the heart of the Roto-180. It is a two-piece structure that joins the truck and dump body by means of a massive, durable 43? industrial roller bearing. DMF raildogs are a safety device that attach to the truck frame of a hi-rail vehicle and clamp to the head of the track. They are used on trucks that can experience shifting loads such as a DMF Roto-180 that is dumping ballast or a boom truck doing heavy trackside picks. In the event of a sudden load shift, the raildogs may prevent or at least minimize the effects of a tipping accident.